2013 Astronaut Hall of Fame inductees, from left to right: Curtis Brown, Eileen Collins and Bonnie Dunbar. A trailblazing commander, the commander of a trailblazer, and a payload commander will be inducted into the U.S. Astronaut Hall of Fame this April. Eileen Collins, the first woman to lead a shuttle mission, Curtis Brown, who commanded John Glenn's triumphant return to space and Bonnie Dunbar, who managed life and science experiments on Spacelab and Mir space station missions, were confirmed as this year's honorees by the Astronaut Scholarship Foundation (ASF), which oversees the Hall of Fame's annual selections. 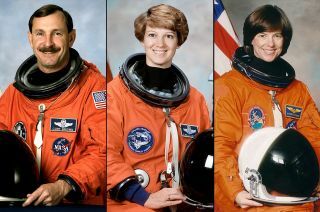 The three veteran space shuttle crew members will be added to the 81 astronauts enshrined in the Astronaut Hall of Fame since 1990, including NASA's Mercury, Gemini and Apollo program pioneers. An induction ceremony will be held on Saturday, April 20, at the Kennedy Space Center Visitor Complex in Florida, where the Astronaut Hall of Fame is located. STS-114 shuttle commander Eileen Collins on the "Late Show with David Letterman." Two years later, Collins revisited Mir, this time docking at the outpost, as pilot of Atlantis' STS-84 mission. She then was assigned her first command and, as the first female mission commander, led the STS-93 crew flying Columbia to deploy the Chandra X-ray Observatory in July 1999. It was the tragic loss of Columbia, 10 years ago this Feb. 1, that led to Collins leading the fleet's second "return to flight" mission. As commander of the STS-114 mission in 2005, Collins and her crew visited the International Space Station (ISS) and tested new safety procedures. Collins left NASA in 2006 after logging nearly 40 days in space. A former test pilot, Collins retired from the U.S. Air Force with the rank of colonel. Curtis Brown flew six times to space, including leading a mission to service the Hubble Space Telescope, but his most high profile flight came in 1998 when he commanded a crew of five "astronaut heroes and an American legend." Selected as an astronaut in 1987, Brown's first flight was as pilot of NASA's 50th space shuttle mission, STS-47 in Sept. 1992. He followed that with two more flights as pilot: STS-66, dedicated to studying how the energy of the sun affects Earth's climate and its environment, and STS-77, devoted to commercial science experiments. Brown's first command was of the STS-85 mission, which deployed and retrieved a satellite to study Earth's middle atmosphere. The flight also tested a Japanese robotic arm before its design was to be used on board the International Space Station. It was a crew member, rather than a payload, that grabbed the spotlight on Brown's next flight. Launching on the 25th mission for space shuttle Discovery, Brown's six member STS-95 crew included John Glenn, who 36 years earlier became the first American to orbit the Earth. The mission was dedicated in part to studying the effects microgravity had on the aging process as Glenn, at 77, was the oldest person to ever fly into space. Brown's final flight was as commander of the third mission to service the Hubble Space Telescope. Flying on board Discovery, the STS-103 mission broke the record for the highest orbit ever achieved by the space shuttle. At their apogee, Brown and his crewmates were 378 miles (609 kilometers) above the Earth. Brown retired from the astronaut corps soon after returning to Earth, having logged over his career a total of nearly 60 days in space. A retired U.S. Air Force colonel, he went on to fly for American Airlines. Bonnie Dunbar was working as a guidance and navigation officer (GUIDO) in Mission Control when she was chosen as an astronaut in August 1981, just four months after the space shuttle began flying. The ninth woman to fly in space, Dunbar's maiden launch in 1985 was on board Challenger's final complete mission before it was lost in flight in January 1986. Dunbar and her seven STS-61A crewmates set the record for the largest contingent on any single spacecraft for the entire mission from launch to landing. Dunbar's second mission, STS-32, saw her take control of the shuttle's robotic arm to grab hold of the Long Duration Exposure Facility (LDEF), a school bus-sized cylindrical experiment module, for its return to the Earth. Her third spaceflight, STS-50, set a new duration record of 13 days as the first Extended Duration Orbiter (EDO) mission. Dunbar's fourth trip to space marked the first time a space shuttle docked with Russia's Mir space station, as well as the 100th crewed mission for the United States. Prior to flying on STS-71, Dunbar trained for 13 months at the Yuri Gagarin Cosmonaut Training Center in Star City, located outside of Moscow, where she qualified for a long duration flight aboard Mir (a mission that never came to be). For her final flight, Dunbar served as payload commander on STS-89, the second to last shuttle-Mir docking, making her responsible for all payload activities including over 20 technology and science experiments. In total, she logged more than 50 days in orbit in the course of her flying five missions. Before resigning from NASA in 2005, Dunbar was named assistant director of the Missions Operations Directorate at Johnson Space Center in Houston and served as the deputy associate administrator for the Office of Life and Microgravity Sciences at NASA Headquarters. Following her departure, she served as president and CEO of The Museum of Flight in Seattle until April 2010. Brown, Collins and Dunbar comprise the 12th class of astronauts from the space shuttle program chosen for the U.S. Astronaut Hall of Fame. They are the second group of space shuttle veterans to be selected since the 30-year program came to its end in 2011. They were chosen by a committee of more than 80 retired NASA officials, historians, journalists and all the members of the Hall of Fame, as organized and managed by the Astronaut Scholarship Foundation. To have been eligible for consideration in 2013, astronauts needed to have made their first space mission in 1995 or earlier. They also had to be retired from flight status as a NASA commander, pilot or mission specialist for at least five years, be a U.S. citizen; and have orbited the Earth at least once.